Q: What have you learnt from your return to Formula 1? KR: This season has shown me that I still love racing as much as I ever did. Obviously, I would have not come back to the sport if I did not feel like this. Driving a Formula 1 car still gives me the same inspiration and I feel the same passion for it. Q: Lotus F1 Team is your fourth team in Formula 1: how have things gelled? KR: I have been very happy with the team; how they work, how they approach the races and how they invest in developing the car. I think with the progress behind the scenes at Enstone we could be fighting for the podium even more often next year and also be able to make a stronger challenge for the Championship. Q: We, and around 500,000 other people, recently saw you signing an enforced contract on YouTube. How civilized was the process with Lotus F1 Team in comparison? KR: Well the team did not need to tie me up and blackmail me with a photo album, unlike certain other contracts you may have seen me sign recently. That was not necessary on this occasion. Q: How strong is your motivation heading into the last races of this year and looking ahead to 2013? KR: My motivation is as strong as it’s always been. I’m keen to race on. Q: How can you build on your experience from 2012 next season? KR: We have proven as team that we can build and develop a strong and reliable car. This year has been a good platform to put down strong foundations for what will hopefully be an even better season next time around. We know what we need to do to improve in some important areas, which should help us get even better results next year. All in all I’m looking forward carrying on working with the team to achieve more good things in 2013. Q: What have you learnt from this year? KR: I think there were a few people who had doubts about how I would perform after being away for a while. Personally, I didn’t feel I stopped racing at all. I may have been doing something different with rallying, but after coming back to Formula 1 I immediately felt fit enough – and fast enough – to start racing again. My hunger for winning is exactly the same as always and I think I’ve shown that I’m capable of fighting for victories. Obviously there have been none so far this year, but we have come close a few times and for sure we’ll keep on trying for as long as it takes to start winning again. Q: What’s the main focus for you in 2013? KR: Of course, the main thing is to do my very best every time, every weekend, every race. I think to be able to perform better in the races I have to find more from myself and from the car in qualifying. This season has shown that you have to be on first two rows to be able to win every time. It’s important to improve our grid positions for 2013. That’s one of main targets for me. 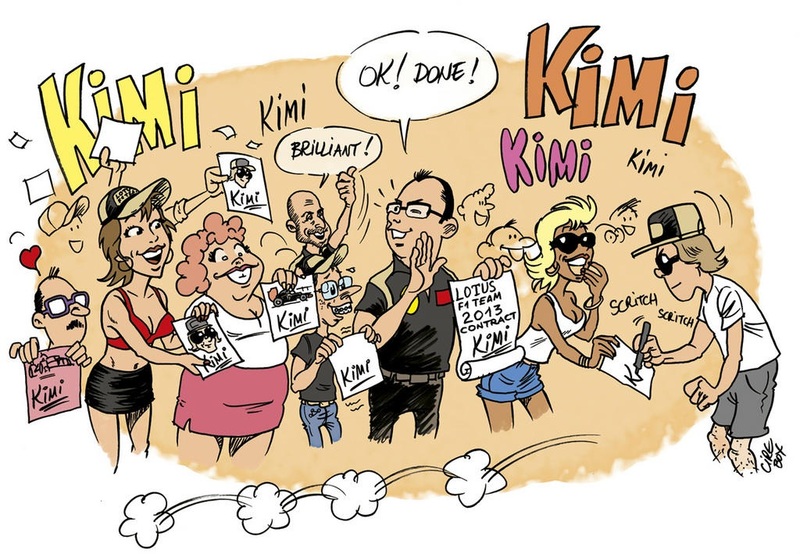 Hi, Kimi, You can be sure, that everybody, who is watching You with opened eyes, can see, how much You love racing – that´s incredible spectacle in the best meaning! Because of this we´re loving You:) Keep going…..